How can I take input text and replace each character with a solid (and/or hollow) rectangle representing the bounding box for that character? 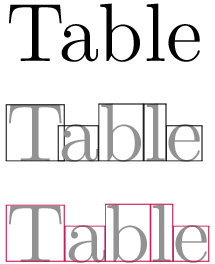 In the case where two characters are closer together from kerning (e.g. microtype) the boxes would overlap. The addition of the boxes should not change the spacing of the text - I'm looking for a "draft mode" for the letters. Both solutions fail however when multiple words are involved. One of the answers completely eats a space while the other overcompensates. Both of them seem to choke on a line break as well. a greater artist than now. Bonus: it draws the base line if the depth of the glyph is not 0.
but hyphenation won't be taken care of. Probably the best is the code from the TeXbook and this I will leave up to you. Another alternative is to study the code from the soul package and use the scanners provided. Change the gray color to white to have the letters disappear. You will need to change the \fbox to basic TeX primitives, if you need to compensate for the 0.1pt rule or use the suggestion of egreg in the comments, which I have incorporated. 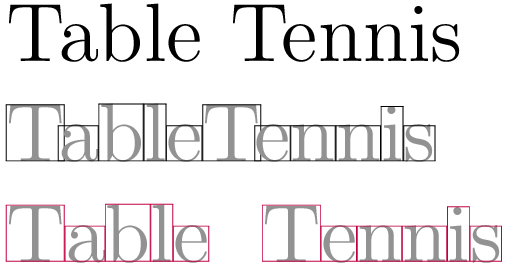 »Tee for Two« shows negative kerning. Not the answer you're looking for? 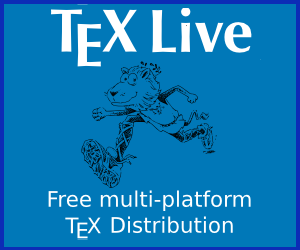 Browse other questions tagged pdftex luatex boxes or ask your own question. How to add barely visible tracking dots to a b/w document? Programatically style words/sentences/paragraphs based on arbitrary metrics? Why is LaTeX causing this font to misalign on one glyph? Is it possible to use \newsavebox with more accurate bounding box?